This Declaration of Warsaw was adopted by the 300 participants from about 30 countries on 26th May 2009. The participants of the 4th Organic Marketing Forum in Warsaw - International meeting on processing and marketing of organic products and raw materials - call for an EU-wide moratorium on the authorization and the commercial planting of genetically modified organisms (GMOs). 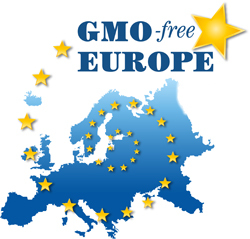 In the wake of six EU member states banning the planting of MON810 and in light of the rapid increase in GMO-free regions in Europe, there has never been a better moment for a moratorium than now. • secure nature protection areas in the interest of a sustainable development against the harmful impacts of an intensive farming with GMO. • the costs for controlling and separation of materials on the level of processing and trade stand in utter disproportion to the claimed benefits of these GMO plants for the acting farmers and industry. The actors of GMO need to assume the costs of the agro-genetic complex. We call upon the agro-chemical companies to no longer abuse the problem of world hunger in order to justify the introduction of GMOs. Practical experience belies this misleading propaganda which we consider to be false and unethical. We are grateful to the citizens, farmers and organizations of Europe who show the way for all of Europe with their declaration of GMO free regions.